Perfect for youth thru adult players and fans. Available in any school and/or team colors for all sports! 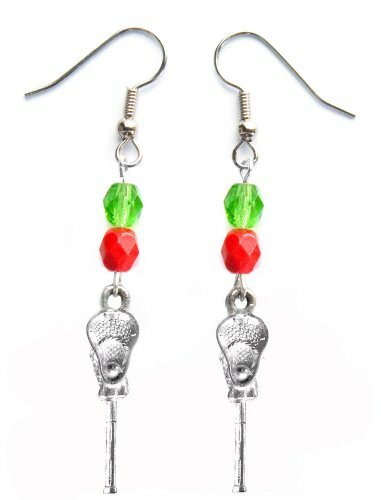 These hand made earrings feature superior quality fire polished glass beads. Fire polished beads from the Czech Republic are made in small quantities by hand and machine faceted then "polished" by carefully melting the beads ever so slightly in huge ovens so that surfaces and edges smooth out. This process gives the beads their distinctive brilliance. The fire used to create these sparkling little treasures seems to radiate from within the bead itself. Fire polished beads contain no lead. Colors and dye lots of fire polished glass beads may vary. Earrings include 2 lead free pewter charms with fine detail and eloquent finish. Unlike other charms that tarnish or fade over time, pewter retains its finish and beauty. If you have any questions about this product by Edge Sports, contact us by completing and submitting the form below. If you are looking for a specif part number, please include it with your message.